Heat half the oil in a wok or large frying pan over high heat. Add the ginger and garlic and cook for 30 seconds. Add the rice and sweet soy sauce and cook for 4 minutes. While the rice is cooking, heat the remaining oil in a small non-stick frying pan over high heat. Add the eggs and cook for 1–2 minutes or until just golden brown. Carefully turn over the omelette and cook for a further 1 minute or until just set. Remove from pan, roll up and cut into slices. 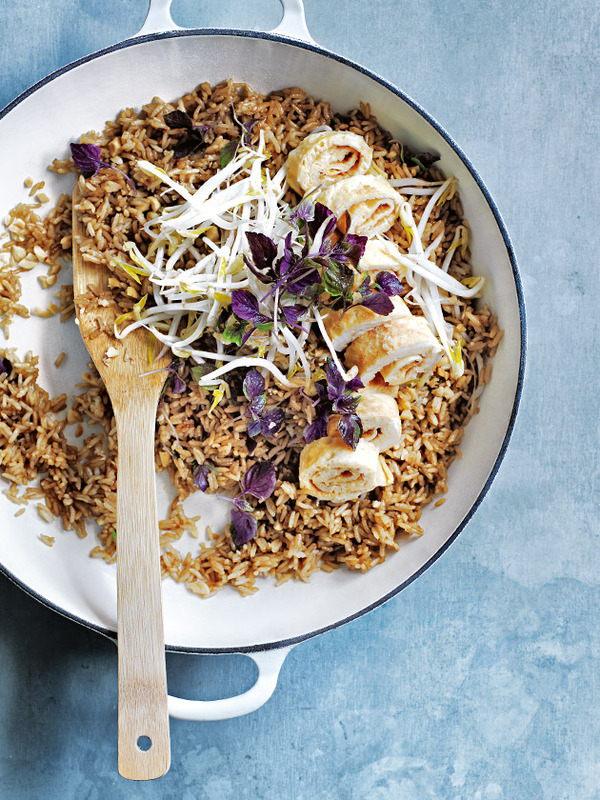 Divide the rice between bowls and top with the omelette, peanut, bean sprouts and shiso to serve. Serves 2 or 4 as a side. + 1⅓ cups (265g) uncooked rice will yield 4 cups cooked rice.